Bay Oaks is an exclusive master-planned community in Clear Lake City. Located at the intersection of Clear Lake City Blvd and Space Center Blvd, Bay Oaks spans a 690-acre area with more than 1,000 homes. Developed in 1989 and built out by 2002, Bay Oaks features streets lined with elegant homes and mature oaks. The community wraps around the 18-hole Bay Oaks Country Club designed by Arthur Hills, ASGCA. It has a course rating of 74.7 and a slope rating of 134. Bay Oaks homes are centrally located near parks, restaurants, cafes, and schools. Major freeways, including Beltway 8 (Sam Houston Parkway) and Gulf Freeway (I-45) are minutes away from the community. NASA’s Johnson Space Center and other employments are also highly accessible from Bay Oaks homes for sale. The community offers a great selection of homes, ranging from patio homes to luxury estates. Apart from the golf course, Bay Oaks also features a pool, tennis courts, a basketball court, plus several parks and playgrounds. Homes in the area range from 3-bedroom homes on 6,000-square foot lots, to luxury homes with 5- to 6 bedrooms on large 15,000 plots. 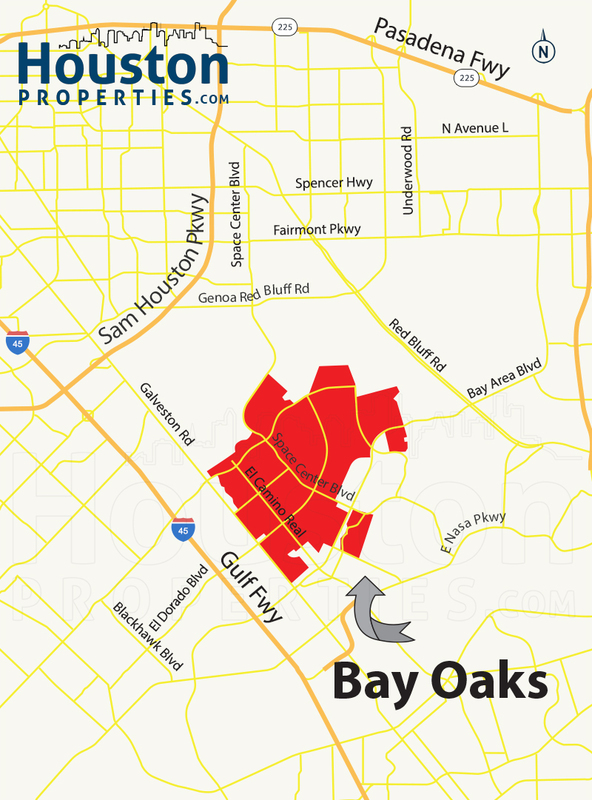 Prices for Bay Oaks homes for sale are between $330,000 to $1.8M. I am interested in Bay Oaks and would like to get more details. Bay Oaks is a beautifully wooded, master-planned community in Clear Lake City. Located a few miles outside Beltway 8, the community covers a 690-acre area east of I-45. Built around a golf course, Bay Oaks is nestled at the intersection of Space Center Blvd and Clear Lake City Blvd. Johnson Space Center and other employment centers are located nearby, along with parks, restaurants, and retail and entertainment hubs. The master-planned community is wrapped around the Bay Oaks Country Club and Golf Course, an 18-hole championship course. Designed by Arthur Hills, it has a course rating of 74.6 and a slope rating of 134. Other community amenities include 5 playgrounds, parks (Community Park, Dinosaur Park, and 2 pocket parks), a basketball court, a baseball field, and a pool. Bay Oaks homes are zoned to the Clear Creek Independent School District (CCISD), and students in the area may attend Falcon Pass Elementary, Space Center Intermediate School, and Clear Lake High School. The community is made up of single-family homes, with lot sizes ranging from 7,000 to more 15,000 square feet. Architectural styles vary, with some homes featuring contemporary/modern designs, while others lean toward traditional aesthetics. A typical Bay Oaks home can offer 3- to 4-bedroom floor plans. Bigger properties can feature up to 6 bedrooms. Homes in the area start at around $330,000, while Bay Oaks luxury homes can go for as much as $1.8M.